After the Camp Fire in November, thousands of people whose homes were destroyed were forced to seek refuge in nearby Chico, Calif. Some 700 people, some in their RVs, are still living at a Red Cross shelter at the Chico fairgrounds. The shelter is expected to close at the end of January. Editor’s Note: NPR’s Kirk Siegler is based temporarily in Butte County, Calif. Along with other reporters, he will be covering the clean-up and recovery effort in and around Paradise. If you want to share your story e-mail natdesk@npr.org with “Paradise” in the subject line. The quaint, college town and farming hub of Chico is clogged. 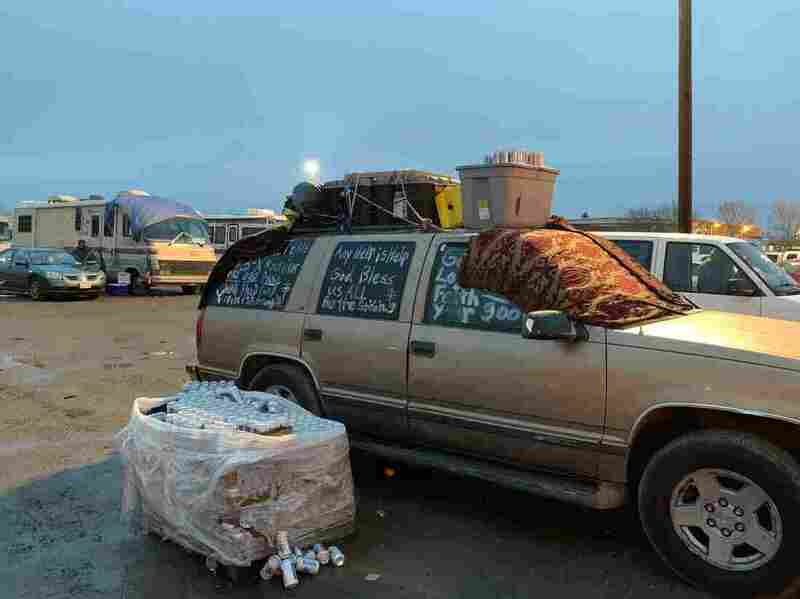 People are living out of every hotel in town. Campers line neighborhood streets and the country roads that fan out into the walnut and citrus orchards. Every guest house and guest room is full. “I live in a bedroom, I’ve lost everything I had,” says Brian Grahlman, 70, one of thousands of victims of last November’s Camp Fire that nearly destroyed the town of Paradise, 15 miles away from Chico. Grahlman narrowly escaped the fire. Now he’s living in a spare room in his daughter’s house here. His home up in Paradise is gone. His wife has to stay with her daughter nearby. “Everybody I know is living with somebody else,” he says. Before the Camp Fire, the small city of Chico in Butte County was already grappling with a severe housing shortage — vacancy rates for the county routinely hovered between 1 and 2 percent. Rents far outpaced wages and there was rising homelessness. Like a lot of rural communities, the area has also been hard hit by the opioid crisis and other addiction issues that are putting a strain on health care and police. Then, literally overnight, Chico’s bedroom community of Paradise almost entirely burned to the ground: 19,000 buildings were destroyed, and thousands of people were displaced. According to one of the world’s leading reinsurers, Germany’s Munich Re, the Camp Fire was deemed the most expensive natural disaster in the world in 2018. More than two months later, there’s a sense of a slow, simmering crisis in Chico. It’s estimated that Chico has had to take in up to 20,000 new people. There’s been a 30 percent spike in traffic accidents, crime is up, classrooms are overflowing. 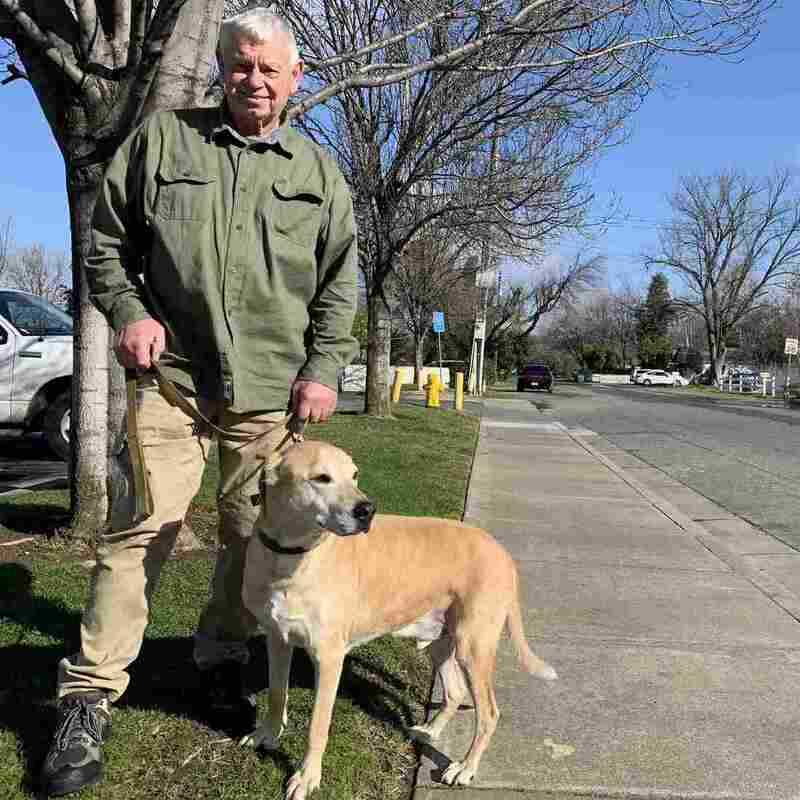 Brian Grahlman and his dog Scout narrowly escaped the Camp Fire. His home in Paradise was destroyed and for now is living with his daughter in Chico. Randall Stone took over as Chico mayor just a few days before the Camp Fire ignited. His town’s infrastructure just wasn’t built for the influx of fire refugees, he says, particularly the roads. The thousands of newcomers don’t always know where they’re going. In terms of short term solutions, this rural region has had no choice but to rely heavily on state and federal disaster funds. So folks here reacted with shock and confusion when President Trump threatened to cut off federal disaster aid in a tweet about how federal forests are managed in California. The bulk of the forests in this state are either privately owned or managed by the federal government. But officials like Stone didn’t have time to try and decipher or fact check the president’s tweet. The Trump twitter scare seemed to follow a pattern. One day it looks like things might be getting better, and then there’s another setback. The single most immediate concern is what to do about the nearly 700 hundred people who — more than two months on — are still living in their cars or RVs at a Red Cross shelter at the Chico fairgrounds. A message, written in white spray paint on a car window, says ‘any help is help.’ The car sits in the parking lot of a shelter in Chico where, more than two months after the fire, 700 victims still live. The Red Cross is expected to pull up stakes at the end of the month. But the shelter is still seeing new arrivals. After weeks of couch surfing or paying out of pocket for a hotel, people have nowhere else to go. Five of Mayer’s employees lost their homes in the fire, and most of the rest of his staff are housing displaced families. Federal HUD staffers moved into his office recently to work with his office to find willing landlords across the entire western United States. Fire victims have already been relocated to Idaho, Montana, Arizona, Utah and Colorado. Since the fire, Mayer has been saying what a lot of other people are afraid to say: folks are going to have to move out of the region. “We may have natural disasters like the Camp Fire, but we [also] have man-made disasters,” Mayer says. California communities are simply not able to absorb a large natural disaster like, Mayer says, because the region is also grappling with an ongoing housing shortage. It’s widely feared that, with climate change and future wildfires, the housing crunch could only get worse. Many Chico leaders point to the irony that, in a region with an ongoing affordable housing crisis, if and when Paradise rebuilds, the new town will probably have tougher building codes and be more expensive. And that new town won’t even happen for years. Next : The Critics’ Choice Is ‘Roma.’ Will It Be Oscar’s?